Their father, Manjibhai Patel (Moradia), a high school principal, wanted them to become doctors or engineers. But for brothers Haresh, Mukesh and Nitesh Patel, setting up their own business and making it successful was a dream they had chased since childhood. 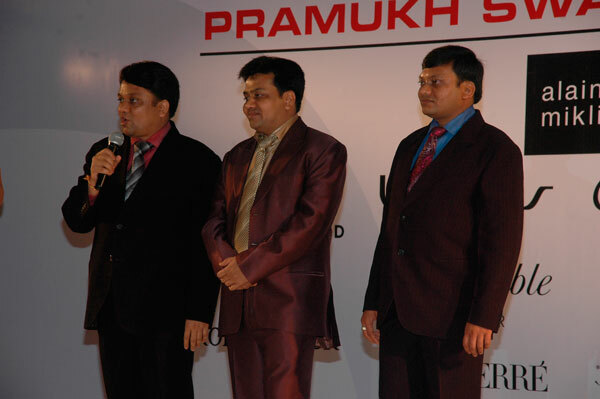 In 1998, they started their own company – Pramukh Opticals. It is the unbreakable bond between the three brothers and their common vision that has catapulted Pramukh Opticals to occupy one of the top positions in the distribution network, distributing top grade international brands as well as promoting their own home grown brands. In fact, that’s how it all started. With their house brands, Elvis and Swami. At a time when customers were aware of international brands and were actively looking to buy them, here was this company, a newbie in the fray, that was looking to sell its home products. With odds stacked against them, the Patel brothers got set with their two-point strategy. One was to source for other international brands that could find a footing in India. The other was to meet retailers across the country to introduce their products. “In a month, we travelled for 20 to 25 days – from Nagercoil to Srinagar and from Gujarat to Assam. We believe in hard work. There were many roadblocks. But when you are focused on your goal and have faith in your work, these roadblocks just fall by the wayside. And today our presence can be seen in the whole of India,” says Nitesh Patel with a smile. Some of the best brands in the world are being distributed by Pramukh Opticals. Charriol and Azzaro for the last twelve years. Façonnable, for the last nine years, Henry Jullien and Guy Laroche for the last six years, DKNY for the last two years and GANT, Harley Davidson, Kenneth Cole and Carolina Herrera for the last one year. Without doubt, an impressive list. Each of these brands are sold with unique qualities, which are carefully chosen and promoted. For instance, Henry Jullien is manufactured with Sandvik Nanoflex which has 19 per cent less weight than titanium. It is also roll gold filled. For brands like DKNY, its fame precedes it. Kenneth Cole and GANT are both manufactured by Marcolin and have an impressive presence in India. Harley Davidson, on the other hand, is a hugely popular brand amongst the youth. Façonnable and Carolina Herrera offer the finest quality products. Carolina Herrera, specially, is a huge hit with refill orders almost dovetailing fresh orders. Manufactured by De Rigo, Carolina Herrera is ranked third in the De Rigo stable. Both Azzaro and Guy Laroche are hugely popular internationally and in India, with Larouche being a haute couture luxury brand and Azzaro, the famous perfume brand. The Moradia brothers are the best people to do business with. We have been associated with them for the past 15 years, and have no complaints. Their after sales service is excellent, and they always keep good brands from around the world. Also, they are the only suppliers who take us to the source of the eyewear, to fairs such as Silmo and Mido and the manufacturer’s factories. Founded in 1921, this French eyewear brand wears on itself a mantle of credibility and finesse. Add to this smart and savvy design and what you get is eyewear to buy and cherish. For its founder Henry Jullien, this was eyewear with an indefatigable quality. Nearly a century later, the rules of the game remain the same. From gold filled frames in the early eighties to the first stainless steel rimless collection in 1993 – the Melrose saga, to being acclaimed jeweller Boucheron’s official framemaker for a period of seven years, to coloured frames, to launching a new line of coveted eyewear Les Urbaines in 2011, every step ahead has marked a new landmark for Henry Jullien. Their three categories of eyewear – Signatures, Contemporary and Urban – cover the gamut of eyewear styles. In this are incorporated three unique formats – jewelled, tailor-made and limited edition of sunglasses. With such a delectable array of choices, Henry Jullien is naturally a frontbencher.